We take pride in bringing your fencing and deck visions to life. Regardless how big or small your dream project is, our experts will be with you every step of the way to ensure you receive the best customer service, quality care, and most importantly, an outstanding warranty on all our work. Locally owned with headquarters in Pleasant Hill, CA, we are the only SF Bay area custom fencing and decking company committed to working closely with you to design, install, and guarantee 100% satisfaction on your inspired outdoor living space. As the Bay Area continues to grow in population, home owners, and family-friendly developments continue to spread, it’s important to remember how many homes have lake front views, direct water access, a close proximity to street traffic, and many additional perks that come with a dangerous element. G & G Deck and Fence is one of the top fence companies in the area and is no stranger to working with these communities to design and build custom fencing guaranteed to keep properties safe for children, pets, and visitors. Our experts have years of experience working specifically with the custom fencing many homes need. G & G Deck and Fence promises customer satisfaction and our quality guarantee. Our competitive advantage is ensuring we transformed your outdoor living space to exactly what you envisioned. As a local fence company, we are committed to serving local communities and residents. We have spent years transforming residential fences, decks, arbors, and trellises into an outdoor masterpiece that exceeds all your needs and compliments your exterior landscape. 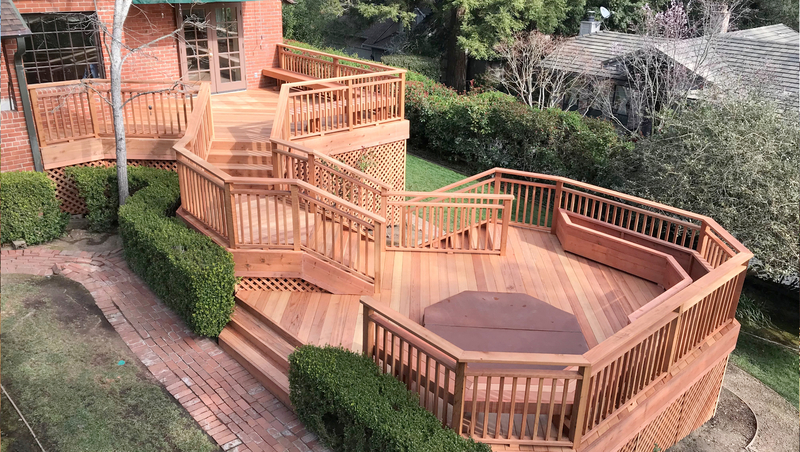 We are one of the only Walnut Creek and Bay Area decking companies with experts that specialize specifically in crafting decks of all shapes and sizes. We can turn ordinary landscapes into extraordinary handcrafted outdoor patio spaces you can enjoy and entertain year round. Tell us about your dream deck, fence, trellis, arbor, or anything you imagine, and we will make it happen. We will work within your budget to make your vision become a reality!